WELCOME TO Public Trails ...................... 4 Rich History ...................... 8 River, Lakes and Waters ................... 12 Experience Nature ................... 14 Taste the County ................... 18 Calendar of Events ................... 24 Argyle ................... 26 Benton ................... 27 Belmont ................... 28 Blanchardville ................... 30 Cuba City ................... 32 Darlington ................... 34 Gratiot ................... 36 South Wayne ................... 36 Map ................... 37 Shullsburg ................... 38 Advertiser’s Directory ................... 40 Scan this code to take you to our Facebook page! LAFAYETTE COUNTY It’s a wonderful life here in the dri�less region in Southwest Wisconsin. If you would like to come and visit us, it will be a pleasure to serve you! If you are looking for a li�le peace and quiet, a respite from the hustle and bustle of chao�c life, Lafaye�e County is just what you need to reenergize, reorganize and renew your spirit. Lafaye�e County has a rich history and played a signiﬁcant role in the early beginnings of our state. Se�lers arrived in the early 1820s to mine the lead in the region. Early miners had no �me to build permanent homes so they clawed out hillsides resembling badger holes to make crude dwellings. Those original miners were the inspira�on for Wisconsin becoming known as the Badger State. Go Badgers! It won’t take long for you to discover that Lafaye�e County is farm country! We are the most agriculturally dependent county in the state. With many cheese factories, dairy farms, small vegetable and ﬁber producers, agriculture is the heart of many of our communi�es. If you are looking for outdoor recrea�on, Lafaye�e County has everything you can imagine. We have plenty of opportuni�es to enjoy nature from calm to thrilling! Hiking, bicycling, ﬁshing, hun�ng, canoeing, swimming, ATV riding, horseback riding, cross country skiing and snowmobiling — all oﬀer you a chance to relax and enjoy the beau�ful scenic countryside. For a more relaxing day, take a drive along the winding roads and enjoy a quiet moment with your camera, experience a birdwatching adventure, or take a hike in one of our numerous parks, such as Yellowstone Lake State Park. When you think of small towns and what they have to oﬀer, think of caring people, great schools, community ac�vi�es and pride. Each of our communi�es in Lafaye�e County invests in our future. We support our seven school districts, local hospital and clinic and many churches. We take pride in our youth and believe in our rich history. We would like to share this wonderful small town life and natural beauty with you. Come and experience our small town culture. Meet the folks who make our communi�es great. Enjoy your stay in breathtaking Lafaye�e County. You’ll be glad you came! 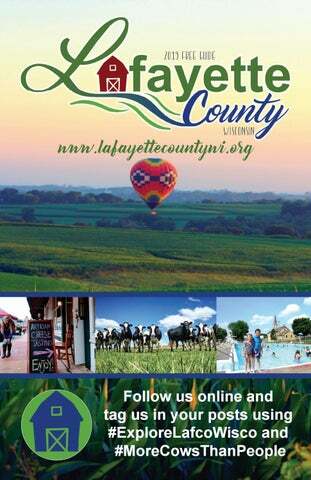 The Lafaye�e County 2019 Travel Planner was published by the Grant, Iowa, Lafaye�e Shopping News in conjunc�on with the University of Wisconsin Extension, Lafaye�e County. No part of this publica�on may be reprinted or otherwise reproduced without the expressed wri�en consent of the University of Wisconsin Extension, Lafaye�e County and the Shopping News. Photo Credits: Dave Aus�n, Jeanne Black, Darlington Chamber, Abby Haas, Painted Light Studios, Cory Ri�erbusch, Anna Robbins and Weigel Dairy. Lafaye�e County is a dream des�na�on for horseback riding. Yellowstone State Park features miles of mowed trails as well as camping. Nearby, the Yellowstone Wildlife Area features approximately 30 miles of equestrian trails laid out over a 2,500 acre wildlife area that feature beau�ful landscapes and abundant wildlife. Call (608) 575-9288 for more informa�on. Several private ranches and saddle clubs oﬀer trail rides, day camps, special rides and events in addi�on to boarding, farrier services, tack shops, rider training and equestrian centers. Saddle up! Motorcycle Trails If you ride an iron horse, Lafaye�e County is as close to the old west as you can get in Wisconsin. Virtually every community in the county has a place to �e up and relax. New Diggings is home to the General Store and Anton’s Saloon — both Midwest des�na�ons for great bands, great rides and great people. The General Store is also a featured stop on Wisconsin’s Canon Run Route 66 for those riders looking to make their way across the en�re state. Each year, local clubs host special events and rides. The unique topography of the region provides breathtaking views, great curves and back-roads that will take you back in �me. Biking Trails The back-roads of Lafaye�e County also oﬀer something special for bikes with less horsepower. With fewer people and more hills, bicyclists will ﬁnd the county a rewarding place to peddle. There are plenty of places to stop for a bite to eat along the way and lodging or camping for rest as you wind your way through the beau�ful countryside. Cycle Southwest Wisconsin provides some great ideas for loops to complete throughout the region, they can be found at www.cyclesouthwestwisconsin.com. New in 2018, the Mound View State Trail is now open as a bike and pedestrian trail. This trail links Belmont and the Pecatonica State Trail to the Rountree Branch Trail in Pla�eville. Please be advised that the Mound View State trail is non-motorized. Scenic Trails You don’t need a bike, boat or horse to enjoy Lafaye�e County. Your car will do just ﬁne. The scenery is wonderful year-round and each small community has something truly special to oﬀer. Finally, if the mood strikes, you can hike the trails at Yellowstone Lake or take a walk down any of the “Main Streets” that make Lafaye�e County such a special place. PUBLIC TRAILS Tri-County ATV Club and its members. The Cheese Country trail connects Lafaye�e to Iowa and Green Coun�es, while County approved road routes for ATV/UTV’s link to Grant County and Jo Daviess County, IL making it easy to see the wonderful landscapes of the dri�less region. The mul�-use trails are open to Hiking, Biking, ATV’s, UTV’s, Snowshoeing, Horseback Riding, snowmobiling and more! Along the trails you will ﬁnd beau�ful scenery including wildlife, rivers and ponds, wildﬂowers and farmland. You will also see all that our communi�es have to oﬀer in area a�rac�ons, shopping, lodging, dining and recrea�on. 6 32 ! ! 29 ! 9 10 ! ! 28 11 ! ! 47 ! 14 ! ! £ ¤ !! ! ! RICH HISTORY Start your history lesson in Shullsburg at The Badger Mining Museum where you can get a glimpse of life through nearly 190 years of this historic community. Learn about Shullsburg’s more infamous stories too – like a daring bank robbery by Chicago mobsters in 1927. At the center of it all is a look back at the important mining industry with displays of minerals, mining equipment and a working replica of the Eagle Pitcher mine. Take a tour into an actual hand-dug 19th century mine. The museum is open daily from Memorial Day to Labor Day. While in Shullsburg, be sure to spend some �me downtown on Water Street, a Na�onal Historic District and the unusual street names like Virtue, Judgement and Hope named by Father Samuel Mazzuchelli, an Italian Missionary Priest. Fr. Mazzuchelli established many local parishes in fron�er Wisconsin and designed more than 24 churches and civic buildings. Just down the road in New Diggings, is St. Augus�ne’s Church, the only church that remains as he originally designed it. Built in 1844, this structure on the Na�onal Register of Historic Places has recently been restored. A memorial Mass is held annually on the last Sunday of August. St. Augus�ne’s is open Sunday a�ernoons from 1:00-4:00 p.m. from May 31 through September 30. For more informa�on call (608) 965-4517. RICH HISTORY of its founders, William “Billy” Hamilton, the youngest son of Alexander Hamilton, U.S. Secretary of Treasury. Billy was a miner and like so many other young men in the 1820s, he was anxious to have a share in the quick riches promised in lead mining country. The Fort Hamilton Historical Marker tells the story of how Captain Hamilton led an eﬀort to construct a fort to house frightened se�lers. Hamilton’s stay in Wisconsin ended when news of gold and even greater riches beckoned them to California. We wind up our historical travels in the County Seat community of Darlington. Darlington is known as the “Pearl of the Pecatonica” because the Pecatonica River which ﬂows through the town was for years a source for the produc�on of pearl bu�on blanks. Take a walk down Darlington’s Historic Main Street which is listed on the Na�onal Register of Historic Places. The restored Driver Opera House after phase 1 is pictured to the right. RIVERS, LAKES AND WATER Yellowstone Lake State Park is in the dri�less area of southwest Wisconsin. This 1,000-acre park, has a 455-acre lake, which oﬀers visitors ample space to enjoy camping, swimming, ﬁshing, boa�ng, hiking, biking and picnicking. In winter the park is open to ice ﬁshing, snowmobiling and crosscountry skiing. Many of the campsites oﬀer electricity hook up for those who prefer this convenience. There is an area of the lake that is a no-wake area, perfect for the canoe enthusiasts. Canoe, row boat and paddle boat rentals are available at the lake for those who do not have a canoe or boat. Yellowstone Lake is regularly stocked with game ﬁsh and oﬀers premium ﬁshing opportuni�es for those who enjoy ﬁshing. Fishing license and trout stamp is required. Please review the ﬁshing regula�ons for the lake to enjoy the best ﬁshing experience. Grab your camera. Bring your binoculars. Take a leisurely drive throughout Lafaye�e County and enjoy spectacular views, with small towns nestled in valleys and winding tree-lined country roads that will weave you along rivers and beside wooded hillsides and farmsteads. You’re likely to see cows do�ng the ﬁelds, a sure sign that you’re in Wisconsin. Check out 65+ barn quilts featured on barns along the country roads – you can get a map showing loca�ons at www.Lafaye�eCountyWI.org/ Explore or stop by the courthouse for a copy. a dona�on for a bird statue, you can stop by The Bluebird Nest Nature Center which is open Wednesday through Saturday from 1:00-5:00 p.m. Camping There are many campgrounds throughout Lafaye�e County, some like Yellowstone Lake State Park, Blackhawk Memorial County Park and Lake Joy Campground, feature gorgeous lakes or rivers and wildlife habitats, others such as DAT Campground and Backyard Campground have camper and tent sites available for short or long term rental, Pecatonica River Trails Park and Wolf Creek Campground are both located right oﬀ the Cheese Country Trail and are perfect for ATVers throughout the warm summer months! Rustic Roads Enjoy a scenic 7.5 mile drive along Rus�c Road 66 in the southwest corner of the county, located just oﬀ County W in the town of Benton. Look for an abandoned lead mine, complete with �n shacks, rusted ore buckets and piles of tailings. This stretch of road oﬀers you a gorgeous drive, especially in autumn with a display of spectacular fall colors. While in this part of Lafaye�e County, you really should make a detour to Gravity Hill and experience something that deﬁes common sense. Just a couple miles outside Shullsburg on County Road U, the highway plunges down a steep hill, across a low area and curves back up a steeper hill. Stop your car about three-quarters of the way down the ﬁrst hill, just short of the 25 mph sign (the spot is also marked on the road) and shi� your vehicle into neutral. You will start rolling backward up the hill, gradually picking up speed. You have to be there to believe it. Pecatonica River Cheese Country Recreation Trail 32 campsites: 30 electric sites, $20/night and 2 non-electric sites, $15/night Sites include fire ring, picnic tables, restrooms, showers, RV dump station, playground equipment, canoe launch, handicapped fishing pier. A two and a half story fully equipped home away from home. Lots of quiet, scenic surroundings and amenities. Have a quilting party, a stamping or carding group, a reception, a honeymoon, or just a quiet getaway. Handicapped accessible and available for up to a week stay. While driving through the county, stop for a bit and enjoy a leisurely hike or a picnic at one of our parks. Belmont State Park is located on County Hwy. G just northwest of Belmont. Belle Mont, French for “beau�ful mountain”, is clearly an appropriate name. The park includes picnic areas, hiking trails and playgrounds. In territorial days, the mound served as a landmark to guide travelers. One of the reasons Governor Dodge placed the First Capitol at Belmont was because it was easy to ﬁnd in the uncharted Wisconsin Territorial wilderness. Yellowstone Lake State Park, located between Blanchardville and Argyle, is open year round. The park is host to many diﬀerent species of wildlife, including whitetail deer, wild turkey, groundhog, fox, grey squirrel and co�ontail rabbit. There have been over 170 species of birds observed in and around the park. Bald eagles, osprey, common loon and the doublecrested cormorant visit the lake in the spring and fall during migra�on. Waterfowl of all kinds, including wood ducks, mallards and Canadian geese use the lake as a rest stop during their migra�on. Sandhill cranes have been observed in the park with their young. The great blue heron is a common resident seen wading in the shallows hun�ng for ﬁsh or frogs. And bats! Yellowstone Lake is the summer home to more than 4,000 li�le brown bats. Nature programs run throughout the summer months. Evening programs have many diﬀerent topics, from bat houses, stars in the night sky, to prairie ecosystems and more. Located directly on the ATV trail! TASTE THE COUNTY: Lafaye�e County is farm country – the most agriculturally dependent county in the state. From large scale dairy farms to small family homesteads, agriculture is the lifeblood of the county. With dairy farmers se�ling in Lafaye�e County, the cheese factories followed next and within our county borders you can ﬁnd some of the best cheese in the country! World Champion Cheeses that are featured all over the world, are made right here in Lafaye�e County. We have a plethora of cheese varie�es for you to try including French, Finnish, goat, Mexican and of course Swiss inspired cheeses. Our specialty cheese producers go above and beyond to create a product that you will awaken your taste buds and leave you yearning for more. With farmers, also comes farmers markets and roadside stands; a truly unique way to try a variety of homemade and homegrown goods right where they are made. Our villages and ci�es oﬀer farmers markets throughout the summer that feature local producers. Honey, tomatoes, ﬂowers, squash, pies, pumpkins, sweet corn, potatoes, eggs, soap, jams and jellies can all be found at our local market stands. Mon.-Thurs., 6 a.m.-6 p.m.; Fri., 6 a.m.-9 p.m., Fri. night fish fry Sat., 6 a.m.-2 p.m.; closed Sun. Access from the Cheese Country Trail! Daily Specials • Homemade Soups • Best Homemade Pizza! TASTE THE COUNTY: Keep your eyes peeled as you travel our winding roads for our many roadside stands that pop-up throughout the region; it’s hard to ﬁnd produce as fresh and ﬂavorful as the varie�es you will ﬁnd there. Our local pubs and restaurants have all found ways to incorporate Lafaye�e County ingredients into their menus. From cheeseburgers featuring our many cheeses and local meats to deep fried cheese curds that are hand ba�ered and deep fried with a secret recipe that you won’t ﬁnd anywhere else and even specialty pizzas, wraps and soups; you won’t go wrong no ma�er where you stop for a bite to eat in our li�le county. GROCERIES, BAKERY & GREENHOUSE Bedding Plants • Vegetable Plants • Herbs Perennials • Fresh Produce in Season. 12'' HUGE Hanging Baskets $17.95 ea. Buy 3/$17.50 ea. All 4'' Pots $2.50 ea. Geraniums & Dahlias $2.95 ea. Baked Goods Friday & Saturday! World Class Prime Rib Every Saturday Night! Over 100 Years of Fine Quality Meats! Lafaye�e County knows how to unwind. We have some very unique events that take place each and every year in our communi�es. Take a look at the calendar below to schedule your visit during one of our annual events! Lafayette County Speedway Lafaye�e County Speedway, located in Darlington, Wis. has a 70-year auto-racing legacy. The slightly banked three-eighths mile clay track has been in existence since the 1950’s. Facili�es can comfortably seat 3,000 fans. Racing begins each April and con�nues into August, with a full weekly schedule, including several large specials throughout the season. More than 600 people a�end the dirt track races each week to watch ﬁve to seven classes race. Hot laps begin at 6:45pm and racing starts shortly a�er 7:00pm. Two family nights occur, one in May and one in August. Each of those events feature more than 100 giveaways for the children. The speedway also oﬀers a $25 family pass during each weekly race program. Learn more about the 60-plus drivers, the summer schedule and more by visi�ng lafaye�ecountyspeedwaywi. com. ARGYLE Nestled into the hills of the northeastern corner of the county, is the community of Argyle, the gateway to Yellowstone Lake State Park and the boyhood home of “Figh�ng Bob” La Folle�e. The Pecatonica River ﬂows through the heart of Argyle, oﬀering opportuni�es for ﬁshing, canoeing and boa�ng. You will ﬁnd three maintained ﬁshing areas, which include community boat landings, a sheltered picnic facility and a handicapped ﬁshing area. Stop in for refreshments at the local pubs and restaurants, browse through several local downtown shops and get acquainted with some of its 850 friendly residents. Argyle is ideally suited for bicycling with spectacular views along winding, tree-lined roads. Nearby a�rac�ons include the Toy Train Museum, the Erickson Wetlands, Yellowstone Golf Course, the Rod & Gun Club and the Cheese Country Trail. For more informa�on on these and other ac�vi�es, check online at argylewi.org. The community of Benton, with its gently rolling hills, lazy streams and fer�le soil is steeped in the tradi�ons and culture of the early Wisconsin lead mining industry. Situated in the southwest corner of the county and bordered on all sides by open land and farm ﬁelds, it is just a stone’s throw from the bordering states of Iowa and Illinois. The Fever River meanders past the eastern boundaries of the village and ﬂows to Galena, Illinois, where it emp�es into the Mississippi River. In addi�on to small businesses located in Benton, the village has developed an industrial park that is ready, along with almost 1,000 residents, to welcome business and industry to the community. Benton is the place to be on Labor Day Weekend. The town overﬂows with people for a Labor Day tradi�on — 123 years in 2019! Ac�vi�es include a chicken barbecue, dance, parade, midway rides, music, games, cra� fair, duck races, pasty dinner and raﬄe. Find more informa�on about Benton at bentonwi.us. With two mounds nearby, it is easy to understand how Belmont came by its name Belle Monte, French for “beau�ful hill.” The village of Belmont today is a few miles from its original loca�on when it was the ﬁrst capitol of the Wisconsin Territory. Be sure to take a trip out to this Wisconsin State Historic Site for a ﬂashback to what fron�er Wisconsin looked like. Belmont is home to two French specialty cheese factories that produce brie, camembert and feta that is distributed worldwide. It also boasts one of the area’s largest greenhouse opera�ons. With direct access to the four lane highway, Belmont is one of the fastest growing communi�es in southwest Wisconsin. The Belmont School and Community Fair, Wisconsin’s oldest (and s�ll free) is held the second weekend a�er Labor Day. It includes a livestock show, carnival, kid’s games, horse show, parade and dance. More Belmont informa�on is always available at belmontwi.com. Paid swim hours available to public between 10am-8pm daily. 419 West Union, Belmont, WI Mon.-Fri. 8:00 a.m.-5:00 p.m. & open the first & third Sat. Dec.-Mar. 8:30-11:30 a.m.
DECEMBER 7 Holiday Party with Santa Claus at High School Cafeteria at 9am with cra�s, ac�vi�es, cookies, milk, face pain�ng, reindeer games, music and movies, 608.732.5254 DECEMBER 8 Ecumenical Christmas Cantata in United Methodist Church at 7pm with punch and cookies following performance, 608.762.5472 Visit belmontwi.com for updated informa�on. Blanchardville is home to plenty of live music, an incredibly user-friendly park, a huge public swimming pool and a modern and an aesthe�cally pleasing campground area situated in an oak tree-canopied park. Wisconsin as the community that’s uniquely known and situated as ‘In The Heart of Four Coun�es!’ A�er all, Blanchardville is located in both Lafaye�e and Iowa coun�es and the nearby Green and Dane county lines are only steps away, making Blanchardville one of southern Wisconsin’s most diversiﬁed geographical des�na�ons! Emberson’s Market is a full-service grocery store. CUBA CITY The City of Presidents While driving down Cuba City’s award-winning Main Street, stop at the Presiden�al Caboose downtown and inspect the Presiden�al Shields which adorn the retro-style light poles in honor of all 45 U.S. Presidents. Main Street is “An�que Avenue” Cuba City won the 2017 Wisconsin Main Street Award for its recent downtown revitaliza�on. An�que Avenue in Cuba City, WI is home to over 35,000 square feet of unique an�ques and collec�bles ranging from architectural salvage to jewelry and primi�ves. Acclaimed Farm to Table Retailers “Made Fresh, Made Local” Weber’s Processing Plant and Retail Store opened in 1905 as a small butcher shop. From handcra�ed ham and bacon to aged hand cut steaks, Weber’s has garnered over 500 State and Na�onal Awards for its meat products. Small batches of fresh sausages and brats made daily. Gile Cheese is a na�onally recognized cheese maker that has been producing handcra�ed cheeses since 1946. Their Colby and Baby Swiss have won several Wisconsin State Championships and all of their products are sourced from a single dairy farm. Grant County’s Best Breakfast Nick’s Café recently celebrated its 15th anniversary and was also recognized as the Best of the Best in Grant County under the Breakfast category. For local events and happenings in the area while you are here! Darlington is an ac�ve community that knows how to have fun all year around. The Pop Factory Players provide theatrical performances that con�nue to draw crowds year after year. A taste of Old Mexico heats up for Cinco de Mayo on the ﬁrst Saturday of May. The vibrant local Hispanic community leads the way with Mariachi bands, dancers in authen�c costumes, piñatas and games for the kids. For four days, over the second full weekend of June, the community goes a li�le crazy with the Canoe Fes�val, a summer party that packs in over 35 events, from stock car races, so�ball and volleyball tournaments, to kids’ shows, parade, ﬁreworks and a memorable canoe race down the Pecatonica River, plus lots more. Music ﬁlls Darlington each Sunday evening in July during Tunes at Twilight. Relax under the shade trees of Veteran’s Park on Main Street and enjoy this summer concert series. The Annual Fall Fes�val and the Pecatonica Valley An�que Days are annual September events. On the ﬁrst Saturday in December, Darlington hosts a lighted Christmas Parade on Main Street that ends with a visit from Santa on the banks of the River. Christmas carols, hot chocolate, bonﬁres and the ligh�ng of the famous ﬂoa�ng Christmas Trees make a picture perfect start to the holiday season. But don’t wait for a special event to visit…Darlington welcomes you any�me to come and enjoy a day, a week or a life�me. Building quality homes in the Tri-State Area for over 35 years. Located in the center of Lafayette County, Darlington is the County Seat. Its historic downtown, filled with shops and services, radiates small town charm and community pride. Built in the 1880’s, The Driver Hotel offers 5 quaint upstairs rooms in historic downtown Darlington, WI. Private bathrooms, charm, and memories await you. Stop in for all your furniture & home decorating needs. All hotel proceeds benefit the non-profit Driver Opera House. For all your camping, hardware and sporting good needs. 121 Pelco Drive (off Hwy. 81 West), Darlington, WI Mon.-Fri. 7 a.m.-8 p.m.; Sat. 7 a.m.- 6 p.m.; Sun. 9 a.m.-4 p.m.
GRATIOT & SOUTH WAYNE Gra�ot Slow down and enjoy some �me in the small village of Gra�ot. With hassle free access to the Cheese Country Trail, along with camping and ﬁshing, this is a great place to get outdoors and enjoy the beauty of southwest Wisconsin. Wolf Creek Campground located on the Cheese Country Trail in Gra�ot oﬀers electricity, water and a new bath house. Gra�ot ﬁreﬁghters host Fish Boils the last Saturday in April and the ﬁrst Saturday in November. Their Annual Chicken Barbecue is always on the Monday of Labor Day Weekend, along with a great parade, music and ball games. More informa�on about Gra�ot is available at gra�ot.us. South Wayne Originally called Collins, named a�er the local railroad superintendent, the railroad played prominently in the crea�on of South Wayne. The rail lines have now been replaced by the Cheese Country Trail, a mul�- use recrea�onal trail that brings thousands to enjoy the beau�ful country of southwest Wisconsin. Every summer, the community cuts loose with the Red Cracker Music Fes�val. The event con�nues to grow in size and dis�nc�on, a�rac�ng more and more people to the village during the ﬁnal weekend in July. Visit Veteran’s Memorial Park in South Wayne. More informa�on about South Wayne is available at gra�ot.us. www.villageofsouthwayne.com. APRIL 27 Fire Department Fish Boil Gra�ot at 5835 Sheldon Street from 5-8 p.m. with ﬁsh boil and raﬄes NOVEMBER 2 Fire Department Fish Boil Gra�ot at 5835 Sheldon Street from 5-8 p.m. with ﬁsh boil and raﬄes SEPTEMBER 2 Annual Chicken Barbecue along with a great parade, music and ball games. 10 1. Wisconsin’s First Capitol Historic Site, County Hwy. G, 3 miles northwest of Belmont. 2. Lafaye�e County Historical Society Museum, 525 Main Street, Darlington. 3. Badger Mine and Museum, 279 W. Estey Street, Shullsburg. 4. Lafaye�e County Courthouse, 626 Main Street, Darlington. 5. Swindler’s Ridge Museum, W. Main Street, Benton. 6. Shullsburg Historic Water Street District, downtown Shullsburg. 7. Saxton House, State Street, Argyle. 8. Partridge Hall/Star Theatre, 200 S. State Street, Argyle. 9. Soldiers and Sailors Memorial Monument, 500 block of Main Street, Darlington. 10. Point of Beginnings, Hwy. 80, south of Hazel Green. 11. Hazel Green, Hwy. 80. 12. Benton, Hwy. 11. 13. Shullsburg, Hwy. 11. 14. Darlington, Hwy. 23. 15. Prairie Spring Hotel, Hwy. 23, about 8 miles north of Darlington. 16. Fort Deﬁance Historical Marker, Hwy. 23 north, about 8 miles north of Darlington. 17. Belmont Mound State Park, Cty. Hwy. G, northeast of Belmont. 18. Blackhawk Memorial Park (Aka Bloody Lake), County Hwy. Y, north of Woodford, six miles south of Argyle. 19. Yellowstone Lake State Park, 8495 Lake Road, west of Argyle and Blanchardville. 20. UW-Pla�eville Pioneer Farm, located in northwestern Lafaye�e County, 29200 College Farm Road, east of Pla�eville. 21. Gravity Hill, Two miles south of Shullsburg on County U 22. The Big “M,” County Hwy. B, rural Belmont. 23. Belmont and Pla�eville Mounds, County Hwy. B between Belmont and Pla�eville. 24. Father Samuel Mazzuchelli Gravesite, Rectory and St. Patrick’s Catholic Church, 237 Main Street, Benton. Shullsburg is Wisconsin’s 3rd oldest city and home to the states mascot, The Badger. Founded in 1827 it was the center of the early lead mining trade. Its downtown is renowned for its charm and restored buildings which represent many diﬀerent architectural styles. The limestone High School, 8-acre Badger Park and two churches are popular stops for history buﬀs. However, Gravity Hill south of town is its most popular tourist des�na�on. Also, receiving a�en�on is the peculiar street names in the Northeast sec�on, all named a�er the virtues of life to live by; Peace, Truth, Happy, Friendship, etc. named by the venerable saint Father Samuel Mazzuchelli in 1844. Badger Mine and Museum located in Badger Park is the only hand dug primi�ve mine open to the public in existence. Today, it is a �ght-knit community with shops, eateries, lodging and services lining its downtown and with many events occurring throughout the year. It is home to Shullsburg Creamery, one of the largest cheese distributors in the na�on. Their Visitors Center located downtown can provide many details about this rich community. Roll Uphill at Gravity Hill Approximately two miles out of town, Highway U plunges down a steep hill, across a low area and curves back up a steeper hill. Stop your car about three-quarters of the way down the ﬁrst hill, just short of the 25 mph sign that announced the curve back up the other side. From here, U appears to drop considerably to the valley ﬂoor before rising again. Place the car in neutral and you will be rolling backward up the hill, slowly at ﬁrst then faster and faster! Visit Badger Mine and Museum in Badger Park located at the center of SW Wisconsin’s lead mining region and experience ﬁrst hand the daily rou�ne of an 1850’s lead miner. During a guided tour, view the tools he used to extract his lead treasure from the earth and learn about his life in this early mining town. A separate experience geared for younger minds is on Saturday and Sunday. Children can learn about lead mining history and early Wisconsin life through hands on experiences and educa�onal games. For more informa�on visit www.badgermineandmuseum.com. WHERE PEACE, GOODNESS AND FRIENDSHIP ARE MORE THAN OUR STREET NAMES —THEY’RE A WAY OF LIFE. Annie’s Bar & Grill 300 Washington St., Darlington, WI (608) 776-3773 Lunch specials. Friday fish fry. Serving lunch & dinner. Close to the ATV trails. Open 7 days a week, 11 a.m.-close. Husie’s Bar & Grill 211 S. Main St., Blanchardville, WI (608) 523-4085 Breakfast served Monday-Saturday, 6 a.m.-11 a.m. & Sunday, 7 a.m.-Noon. Lunch specials every Monday-Friday. Friday night fish, Saturday homemade pizzas & chargrill. Pool & music! Irma’s Kitchen P.O. Box 425, Milwaukee St., Argyle, WI (608) 543-3703 Home cooking, homemade pies & daily specials. Hours: Monday-Friday, 6:30 a.m.3 p.m.; Saturday, 6:30 a.m.-2 p.m.; closed Sundays. Lawrence’s Pub & Eatery Main St., Benton, WI (608) 759-4000 Daily specials, homemade soups & best homemade pizza around. Friday night fish specials & Saturday night prime rib. McCarville’s My Turn Pub 101 W. Commerce St., Belmont, WI (608) 762-6191 Fun atmosphere & great food! Lunch & nightly specials.On the ATV trail. Ask us about catering your next event. Rachel & Rays Pub & Grill 308 S. Main St., Blanchardville, WI (608) 523-4888 Monday-Thursday & Sunday, 11 a.m.-11 p.m.; Friday, 11 a.m.-2 a.m.; Saturday, 9 a.m.-2 a.m. Sandwiches, appetizers & pizza. Sherrell Jean’s Diner 108 E. Monroe St., South Wayne, WI (608) 439-5567 Homemade cooking. Access to Cheese Country Trail. Open Monday-Saturday; Friday night fish fry. Closed Sundays. Sports Page 117 Commerce St., Belmont, WI (608) 762-5100 Nightly specials with drink specials. Banquet hall available. Watch sports games here. Located on the ATV trail. The Burg 134 W. Water St., Shullsburg, WI (608) 965-3700 A classic tavern & casual dining. Open daily at 11 a.m. The Corner Pub & Deli Corner of 78 & 81, Argyle, WI (608) 543-3711 Full menu with fresh deli. Enjoy our patio. The Viking Café 210 S. Main St., Blanchardville, WI (608) 523-4327 Great home cookin’. Water Street Place 202 W. Water St., Shullsburg, WI (608) 965-3226 Thursday, Italian Night; Friday Fish Fry; Saturday, Steak Night. Breakfast served Saturday & Sunday mornings. Water Street Market & Cafe 133 W. Water St., Shullsburg, WI (608) 482-4075 Cafe, candy store & vintage store. Wheel In 344 Hwy. 11, Shullsburg, WI (608) 965-4455 Deli, homemade salads, pies & soup. Daily lunch & nightly specials. Entertainment on Friday & Saturday in Tiki Bar. Health & Beauty Be Still & Know 123-A W. Ann St., Darlington, WI (608) 482-4260 Reiki Healing, Angel Card & Akashic Record Readings. Cuba City Family Dental 206 S. Jackson St., Cuba City, WI (608) 744-2111 Complete family dentistry - general & cosmetic. Memorial Hospital of Lafayette County 800 Clay St., Darlington, WI (608) 776-4466 Full service hospital for over 60 years. Nicole’s Salon & Wellness Center Argyle, WI (608) 543-3114 Full service salon, from hair to nails. Customer satisfaction is our specialty. Village Hair Design Hwy. 11, South Wayne, WI (608) 439-1410 Complete hair salon with cuts, perms & colors. Driver Hotel 123 W. Ann St., Darlington, WI (608) 482-5339 Five quaint upstairs rooms in historic downtown with private bathrooms. Charm and memories await you. Hotel Blanchard 308 S. Main St., Blanchardville, WI (608) 523-4888 hotelblanchard@gmail.com Rooms overlook Main Street, two queen sized beds, refrigerator, coffee maker & smart TV in each room. Both rooms share the bathroom located in the hallway. Sand Berg Retreat, LLC 227874 Jericho Rd., Platteville, WI (608) 762-5569 The perfect getaway with a two and a half story fully equipped home away from home. Lots of quiet, scenic surrounds and amenities. Email sandbergprarie@yousq.net. Quality Inn & Suites 103 W. Mound View Ave., Belmont, WI (608) 762-6900 Free Wi-Fi, exercise facility, in-room coffee, indoor pool & whirlpool & free hot breakfast. Wolf Creek Campground County K, Gratiot, WI Water/electric sites, tent sites, modern shower & restroom with facility on site. Located directly on the ATV trail! Services Ace Concrete, LLC 2499 Robert Homb Memorial Dr., South Wayne, WI (608) 439-5349 Quality concrete, decorative sidewalks, patios & driveways. See us for all of your concrete needs. Benton State Bank Benton & Shullsburg, WI Full service bank with locations in Benton, Tennyson & Shullsburg. “We are outstanding in our community.” Blanchardville CO-OP 401 S. Main St., Blanchardville, WI (608) 523-4293 We market petroleum products through delivery trucks with 3 stores in Argyle, Blanchardville & New Glarus. Brunkow Construction Darlington, WI, (608) 776-3658 www.brunkowconstruction.com Call for an estimate. Building quality homes in the Tri-State Area for over 35 years. Dave’s Auto Body 102 W. Commerce St., Belmont, WI (608) 762-5140 Your personal & professional collision & restoration specialists. First Capitol Salvage R.R. 1, Box 72B, Belmont, WI (608) 762-5308 Processing all types of scrap! Now accepting E-waste. First National Bank of Darlington & Gratiot 245 Main St., Darlington, (608) 776-4071 5800 Philips St., Gratiot, (608) 922-6422 www.fnbdarlington.com Fritz’s Burner Service 180 W. Minerva St., Darlington, WI (608) 776-2123 Commercial, residential, new construction replacement. Heating, cooling, sales & service. Grant Equipment Hwy. 80 S. Cuba City, WI (608) 744-3517 Offering the most complete lines of agricultural equipment with expert product knowledge, flexible financing & quality parts. Nodolf Lumber, Inc. 102 E. Commerce St., Belmont, WI (608) 762-5161 15381 County Shop Rd., Darlington, WI (608) 776-4054 Lumber & building materials, mill work & treated lumber with delivery. Shopping News 11 Means Dr., Platteville, WI (608) 348-2374 or 1-800-236-2537 www.yourshoppingnews.com Delivered FREE every Tuesday or view online at www.yourshoppingnews.com. Spensley Feed Sales 425 N. Mound Ave., Belmont, WI (608) 762-5143 Feed ingredients, premixes, custom mixes & liquid feed sales. Weber’s Processing 725 N. Jackson St., Cuba City, WI (608) 744-2159 Full service retail butcher shop. Grilling & picnic supplies & cheese. Fresh meat cut to order. Cushman’s Greenhouse 25655 Schultz Ln., Belmont, WI (608) 762-5795 30+ years experience. The largest greenhouse in the tri-state area. Best selection for every season. Emberson’s Market 200 S. Main St., Blanchardville, WI (608) 523-1441 A full-service grocery store with seasonal produce & a fresh deli. First Capitol Mini-Mart 423 N. Mound Ave., Belmont, WI (608) 762-5187 Friendly hometown service, gas, ATM, convenience store, just off the trail. Gile Cheese 116 N. Main St., Cuba City, WI (608) 744-3456 www.gilecheese.com J.A.C.E. Boutique & Gifts 211 W. Water St., Shullsburg, WI (608) 482-3369 Womens clothing, accessories & gifts. Junk & Disorderly Antiques & Other Treasurers 408 S. Main St., Blanchardville, WI (608) 523-AGED (2433) Antiques, military items, vintage, crafts & collectibles. Closed Mondays. Main Furniture & Home 229 Main St., Darlington, WI (608) 776-2125 mainfurnitureandhome@gmail.com For all your furniture & home decorating needs. Marilyn’s 238 Main St., Darlington, WI (608) 776-3070 Fashionable clothing, exquisite jewelry, one-of-a-kind accessories & special cards. Mathy’s Ace Hardware 226 Main St., Darlington, WI (608) 776-3729 Sporting & hardware goods. Craftsman tools, camping supplies, rain gear & boots. Over 200 guns in stock! Mound View RV 769 W. Liberty St., Belmont, WI (608) 762-6957 or 1-866-825-4858 www.moundviewrv.com Sales, service, parts & accessories. Paint & Rust Merchantile 201 S. Main St., Blanchardville, WI (608) 523-4545 Paintandrustwi.gmail.com Home goods, gifts, events, custom signs & memorials. Pilgrims Pantry 3972 Old Hwy. 11, South Wayne, WI (608) 439-1064 Bulk food store & bakery with pies, breads, cookies & snacks. Monday-Saturday 8 a.m.-5 p.m. & closed Sundays. Pins & Pieces Quilt Shop 208 Main St., Darlington, WI (608) 776-2116 Quality fabrics, tuxedo rentals & quilting classes. Roelli Cheese Haus 15982 Hwy. 11, Shullsburg, WI (608) 965-3779 or 1-800-575-4372 www.roellicheese.com Scott Implement 166 Mine Rd Platteville, WI 608-348-6565 AGCO/Massey Ferguson & New Holland Farm Equipment dealer serving the Tri-State area of Northwest Illinois, Northeast Iowa & Southwest Wisconsin. Shullsburg Cheese Store 210 N. Water St., Shullsburg, WI (608) 965-3855 www.shullsburgcreamery.com South Wayne Mart 210 W. St. Hwy. 11, South Wayne, WI (608) 439-5900 Convenience store on the ATV trail with maps & plenty of supplies. 24 hour express pumps.